Meet Katie, Our Outreach Coordinator! Kit Curl: Hi, Katie! Please tell us a little bit about yourself and your role at Girls Rock! Chicago. Katie Teston: I’m Katie Teston. I grew up in Chicago, and I am currently studying sociology, American Sign Language, and music at DePaul University. I have been singing in operas, choirs, bands, and as a solo artist since I was ten years old. I love to sing–mostly jazz, blues, soul, and pop. I started at Girls Rock! Chicago as an intern and immediately fell in love with the mission. It is incredibly important to me that girls, gender non-conforming, and trans youth have a space to utilize music to express their ideas and feelings, while also learning the power of their voices in this world. It is important to me that all Chicago kids have the opportunity to experience music they want, and need it. I am the Outreach coordinator; I recruit campers and volunteers! KC: And what are your career and/or life goals? KT: I don’t have a clear cut picture of what I want, BUT I can say I want to be creating, performing, and teaching music! KC: Tell us more about what made you fall in love with the Girls Rock! Chicago mission. KT: Growing up in the Chicago Public Schools (CPS) system showed me how detrimental budget cuts are to students’ exposure to music. It also showed me how impactful music is to Chicago’s youth, and it brings me nothing but pure joy to be able to help create a space for them. I also love helping empower anyone who is oppressed! As a woman of color in the music industry, it is incredibly important to me that kids understand they have the same capabilities as anyone else out there. KC: How will you connect that feeling to your work at Girls Rock! Chicago? KT: I am excited to create a presentation to inform CPS students about GR!C! Our goal is to recruit people from all over Chicago! KC: 2017 was your first summer volunteering with us. Do you have any favorite memories from camp? KT: Our kids are funny beyond belief, so this is hard to narrow down. I do have a good moment though: My 8-11 year old band wrote a song called “We Are So Much More;” I feel like the title speaks for itself. KC: It speaks volumes! If you’re comfortable sharing, do you remember the first injustice you faced because of your gender? Has that influenced you in any way to fight against oppression? KT: I don’t have a specific moment in my mind, but I think I started realizing that I don’t like it when men treat me like i’m stupid when I was around six years old. KC: It is heartbreaking how early we begin facing such oppression. But it can serve as a catalyst. Beyond Girls Rock! Chicago and your studies at DePaul, in what other ways are fighting for social justice in your life? KT: I speak up. When I hear, see, or find people being oppressive in everyday life, I say something about it. I support people in my city! I protest. KC: That is courageous! As you know, GR!C uses music as a tool for change. Can you tell us about the role that music plays in your life? KT: My major and minors are dedicated to my desire to help people and create peace. Music is for me. It has been one of the major forces in my life that has made me unconditionally happy. KC: And finally, who are your favorite musicians and/or bands? KT: I’ve been listening to a lot of Iris Temple lately. I love listening to Lianne La Havas, SZA, Gibbz, Beyonce, Eryn Kane, Lake Street Dive, Etta James, Ella, Alabama Shakes, Childish Gambino, The Black Keys, and so much more. I listen to a lot of R&B, listening to more hip hop. 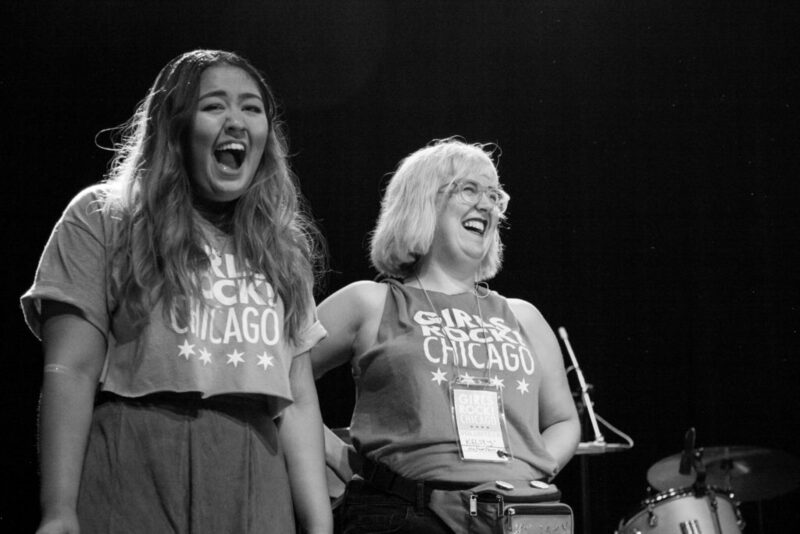 You can talk to Katie about getting involved with GR!C at katiet@girlsrockchicago.org. Katie & Volunteer Coordinator, Kelsey Truman. If you have questions, comments, or praise, we want to hear from you! 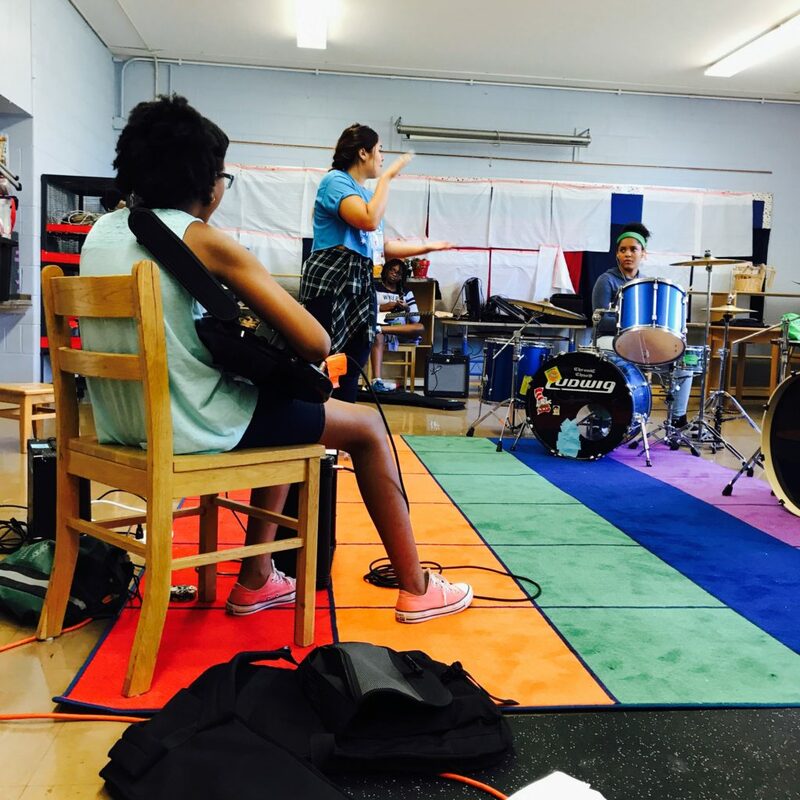 Our office hours are by appointment only - email info@girlsrockchicago.org to schedule a visit!